It happened again. I love it. I have traveled extensively (OK, I am bragging, it will not be the last time, ask Mr. Monchamp), but nothing brings me more pleasure than closing my eyes as the plane descends into Ben Gurion International Airport and I hear true joy from a group of excited teenagers as their hands explode in joy as the plane's wheels caress the Israeli tarmac. 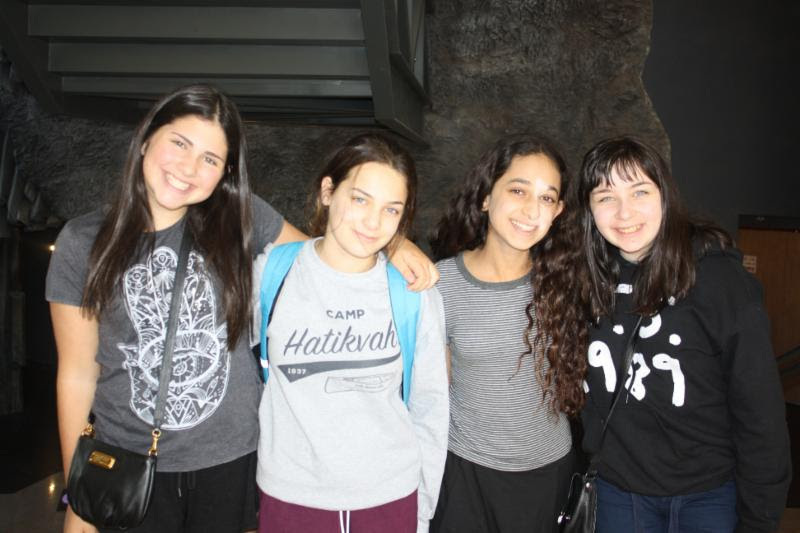 I could travel to Israel every year with the students just to experience that moment. Mercifully other moments bring me back to reality, and as I type these words after 30 hours of wakefulness, spent rather too close to 31 exhausted children, I see clearly that I am getting too old for this (though I am happy to age a year in Israel...). So our plan seems to have worked really well on the staff. The plan to absolutely exhaust everyone that is - it is so hard to carry that out just on the children! 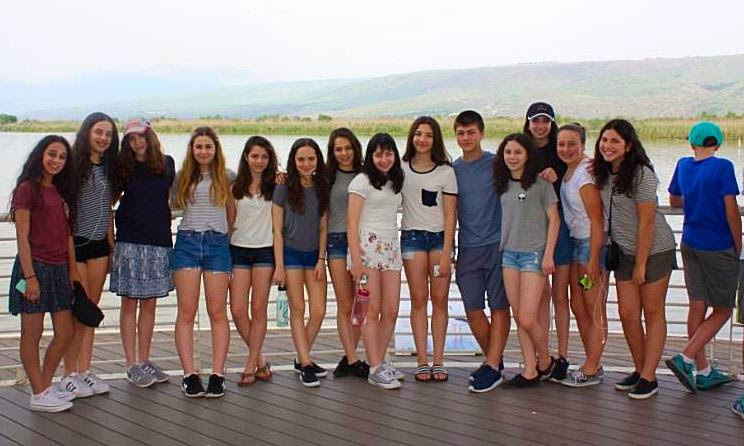 So let me summarize - 31 students (another is joining us in Israel tomorrow) and 5 chaperones - beautiful blue skies and a degree in the Celsius range so high that mentioning it would seem like I am gloating (Mr. Monchamp will assure you - it will not be the last time). For a moment let me allow you to gloat. I cannot tell you how many compliments I received from airline passengers and cabin crew today on our flights - we were all proud to wear our school colours today. Maybe it was my inspiring morning speech when I let the kids know I was sick and if they annoyed me I would... or more likely they are just great kids! I will let you know in 11 days (too early to make assumptions). On the bus beginning our journey north ... happy to be off the plane! So although the exhaustion plan went according to schedule the means was not quite as expected. We were treated by IDC Herzliya - an international university just North of Tel Aviv to some food and drink - I think the kids learned more about the university than your typical Grade 8 student would want - looks like a nice place though, but not the most stimulating of choices for us - but it was warm and the rugela and grapefruit were lovely (though I did not have them together). After that we started the long drive North - which like all long drives was controlled by needs to go to the bathroom and to reinsert product to cause one the need to go the bathroom. So after about 90 minutes we stopped at some roadside mall. I thought this was really cruel - it had an Aroma Coffee - which those of you who have had siblings on this trip before know I believe to be a shrine (iced coffee with ice cream, OMG) - the cruel part was I did not feel well enough to partake - though way too many children mocked me and enjoyed a tasty treat - especially the big children, my chaperone team led by Dorin and Debbie. From here it was back in the bus for another couple of hours, including road delays, as we made our way to Katzrin, a scenic town in the Golan Heights. We came here to view the history of the region to compliment what Dorin teaches the kids in Jewish History class. I have seen the light show many times and learned something every time - but not this time - it stopped working just as we arrived. Yes I love it when a plan comes together and our plan was working to perfection today! Well we did watch the Imax movie and kids screamed when the water sprinkled down on them, I always enjoy that too. Katzrin was still another hour to our hotel, K'far Giladi. It was around 7 p.m. that the kids made it into their rooms where we graciously allowed them to stay for a few brief moments before whisking them to dinner at the hotel - buffet style. Dinner was not too bad - I was surprised that the kids could still eat, many had been grazing all day long. Wake up is at 7:15 a.m. tomorrow and we are at breakfast 45 minutes later. We have a full - let me be clear - busy-every-minute kind of day scheduled tomorrow. 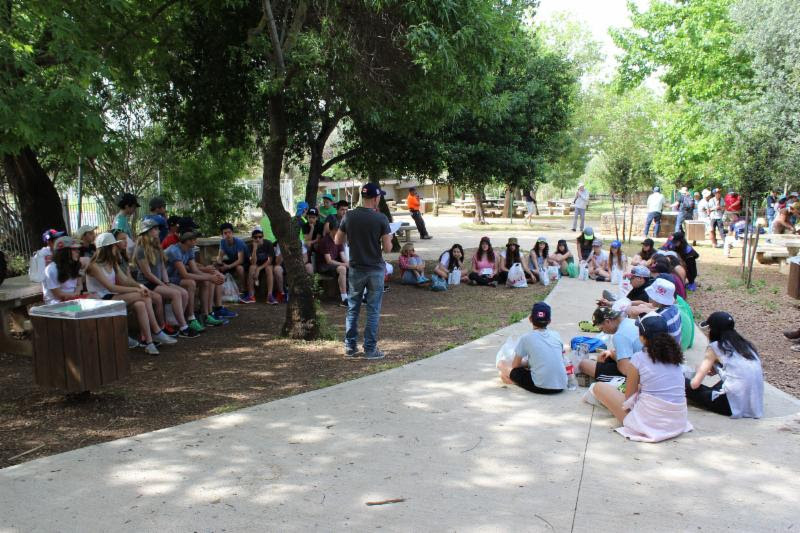 We start by visiting with elementary school kids and then move on to meet our high school peers and hosts - it is going to be one fun, eventful and Hebrew filled day! Don't you hate it when the curtain just does not fully block the bright early morning sun? This was the challenge of the day. Unless you include jetlag and walking with zombies as challenges, but I have heard that at least one of those two things is not real (though this is contrary to my personal experience today). Delightfully, everything went very smoothly this morning. Kids mostly reported periods of sleep during the night, everyone made it to breakfast on time and we all found some very yummy food waiting for us (oh, and there was lots of Israeli Salad too for those that prefer alternatives to yummy - and alternatives do seem to be gaining in popularity - whatever happened to Froot Loops being an essential part of a balanced breakfast?). 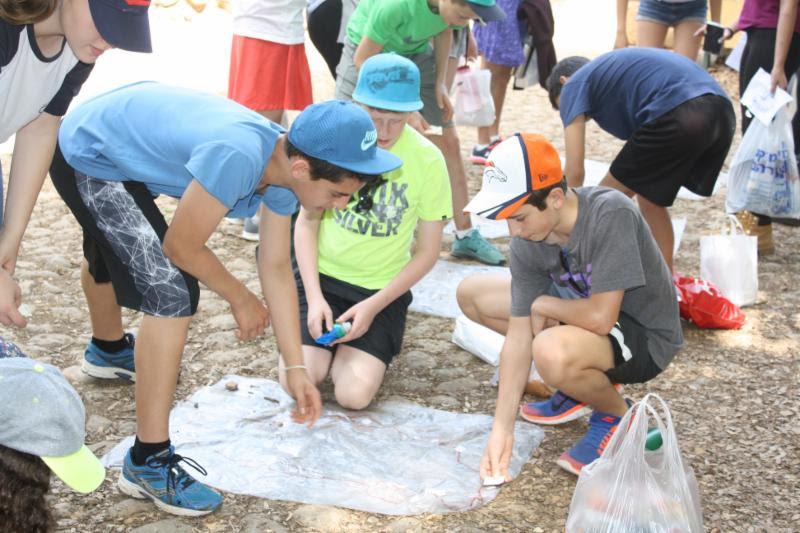 8:40 a.m and we were rolling to our first stop - with one of the partner schools in our Gesher Chai P2G region - HaMeginim Elementary School in Kiryat Shmona. It was a lovely visit as they were having their own Mitzvah Day - and one of their mitzvahs was to make Falafel for us (our mitzvah was naturally to eat it!). Then the students meandered outside - so gorgeous - walking around, enjoying the music and the activities. The Israeli tykes are not shy and language is not a barrier - they just kick a soccer ball at you and the games begin - but be prepared - they take their play seriously (I share this just in case you are approached by a marauding band of Israeli elementary school soccer players). 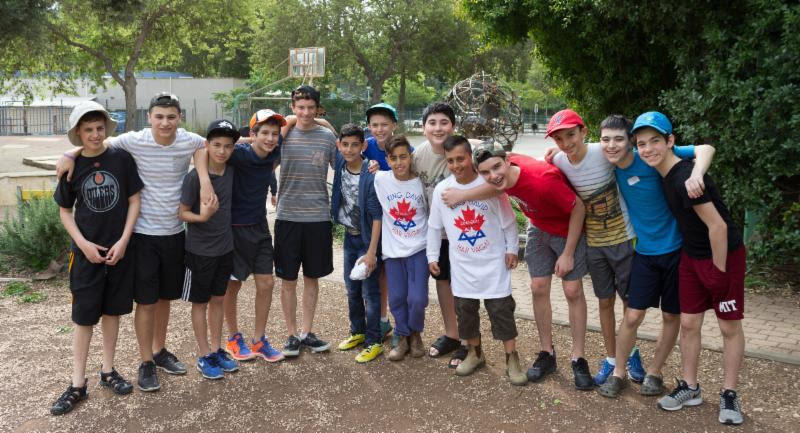 After a couple of hours we headed over to meet our Israeli student hosts and by 11 a.m. we were all together on the beautiful grounds of Har Vagai school. 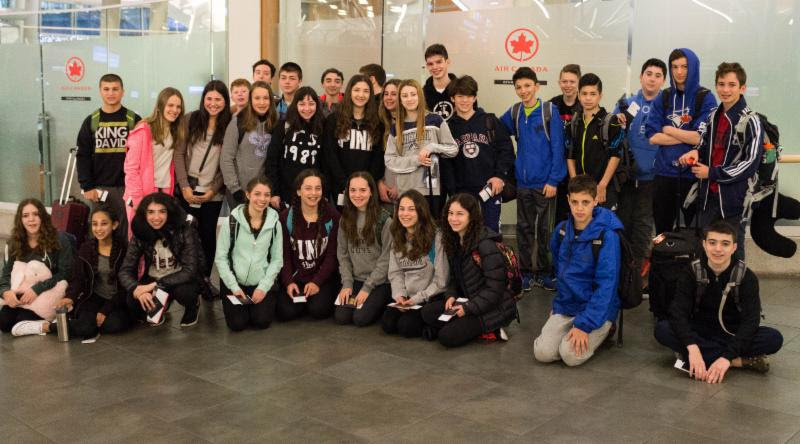 I must have turned my back for a moment or walked slowly from the bus to the meeting spot because by the time I woke up from my happy place it was 11:05 a.m. and I could not tell the Israeli kids from what we are now officially branded - the Canadians. We used to be Canucks but let's face it, "We are not all Canucks" anymore (I am, shhhhh, I am not proud but I am not a bandwagon kinda guy). So the 50 or so kids split into three groups with Har Vagai group leaders and did some ice-breaker activities and they all hung out in the sun (we have offered sunscreen to all but, you know how it is...). Then our kids presented a few videos to the entire Grade 8 class (around 150 students) - on Vancouver and King David. The Israeli teachers told me they could not believe how excited their students were to have us visit - it made us feel very welcome. A little lunch, a little conversation (with only our host Israeli students) and a story from a former British subject on how he moved to Israel in the 1980s, converted to Judaism and became a teacher after first enjoying a kibbutz farming life. As mentioned though we are not really into resting so around 2 p.m. we made our way to the Agamon Hula Valley Bird Paradise. 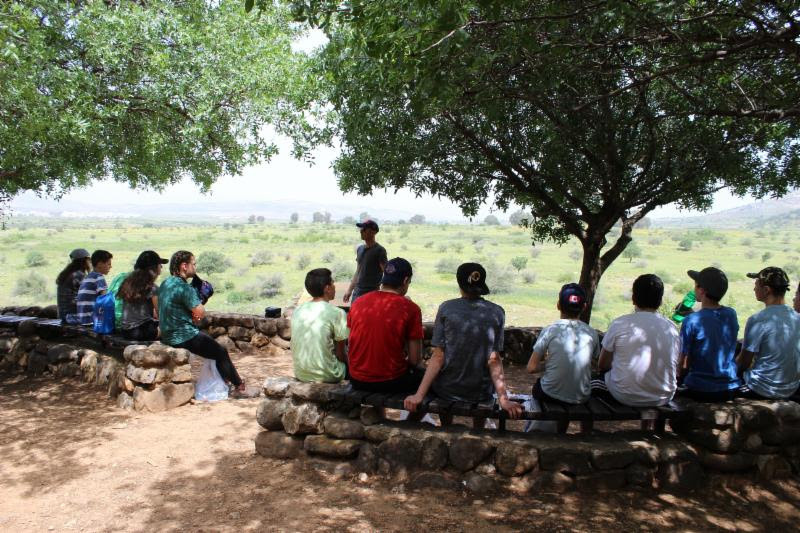 This was a lovely experience that was generously provided to us by the Jewish National Fund (JNF). Here we learned about banding and witnessed the banding of a couple of birds - one a Spanish Sparrow and the other some kind of Warbler (sorry birders I do not remember the type) - it was interesting as they put an ankle bracelet on the bird with ID info so if they are trapped in another country travel data can be collected. Roughly half a billion birds migrate through this valley yearly. Apparently more of the Warblers are choosing to stay in Israel rather than migrate but who wouldn't with the anti-Semitic political situation in Europe (other reduced warbler migration theories include global warming, come on!). Anyway hanging out amongst beautiful green fields and waterways is not a bad way for your typical zombie to recover from jetlag, so all in all it was pretty chill, but a hot kind of chill. Noah releases a Sparrow that has just been banded. One funny thing from the bird watching - a tractor tows a few rows of seating to different areas while the guests sit and look out and search for birds. Watching the head bobs of sleeping children in a row was much like playing dominoes, once one goes down, they all go down! re-packing their bags. They have done well again today. Lots of excitement about 'moving in' day tomorrow but I think some of the mystery and anxiety is lessened now that they have all met their hosts. Tomorrow we have another busy day of merry-making and an earlier start - so I am going to go pack! All systems were go this morning - lovely breakfast, great job by the kids at eating said lovely breakfast. My day could have ended there but the photos would have been rather poor indeed. So, we persevered and by 8:30 a.m. we were all aboard the bus, luggage stored underneath, heading back to Har Vagai School to meet up with our Israeli hosts. At the school we stored our bags and exchanged greetings with our hosts. Then it was back on the bus where we drove just a few minutes to the Tel Dan Nature Reserve. Tel Dan is a beautiful place, with trails and streams and 4,000-year-old ruins. There was a sacrificial alter from the Biblical Kingdom of Dan - a long time ago - and although the thought crossed some minds (not mine of course), its use was not resurrected. From one of the lookouts students looked through binoculars into Lebanon and at the beautiful surrounding hills. At the Reserve the students were divided into groups and during the hiking through this spectacular area (bamboo tunnels and the Dan River crashing all around) they did a number of activities - with older students who were on a Gap Year before going into Military Service (like our own Shinshiniot). The organizers were very enthusiastic and one of the games was more like speed dating - just thought you would want to know what we are doing with your children here (so you wanted them to marry Jewish, no?). 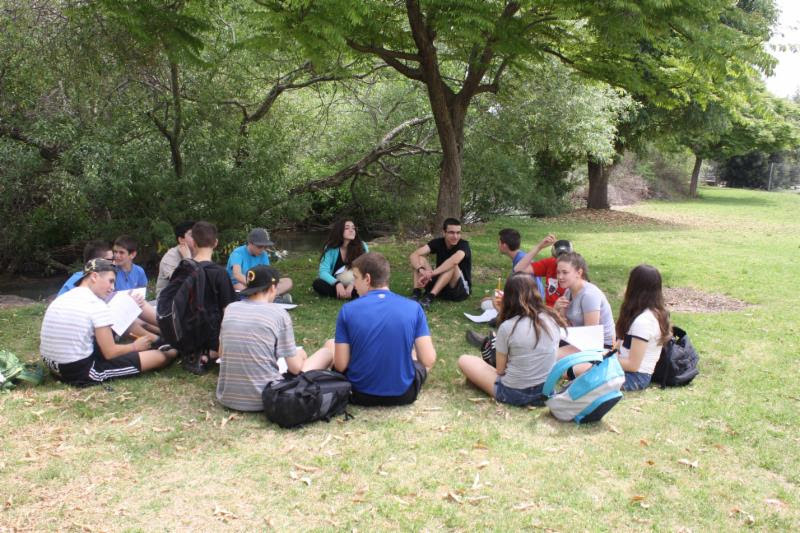 After a few hours the students made their way to a gorgeous, not to mention, freezing, beautiful wading pool, where they relaxed and ate lunch - I think the temperature today was near 30 degrees - and it was so nice and comfortable, definitely more Froot Loop than Israeli Salad! Finally it was time to return to the school where the kids just hung out for about 90 minutes - some played different games, others sat and talked. We gathered them all together around 3:30 p.m for a last minute pep talk and words of encouragement before they left for their first night of home hospitality. Most seemed genuinely thrilled - a few were definitely playing their cards close to their vests. We made sure they had all of our phone numbers and that they knew we were just a phone call and a short drive away. We really are impressed with our students - you should be too!